Cassidy M. '19 maybe a freshman in high school, but there are reasons to believe she could be a freshman in college. 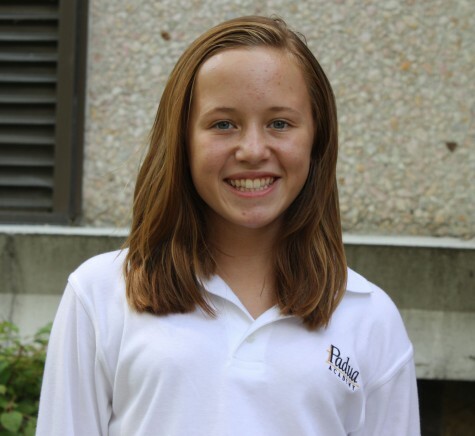 “I have wanted to go to Princeton since I was in fourth grade” Cassidy said. She is extremely mature and very confident, especially for being a freshman. She aspires to be a math professor at the college level and one of her greatest strengths is math, although she does not feel as strongly about the sciences. She always aims to be her best and strives for the highest possibility in everything. Cassidy works well under pressure and is independent. Her interests in journalism class include writing and photography and she hopes to better her writing throughout the course of the year. Cassidy frequently enjoys watching current events and news stories that interest her, when she gets a chance. She is passionate about her school work and is extremely motivated by her future. She is willing to work hard and certainly willing to give it her all in all of her interests. She loves to read, all but non-fiction. When asked about her favorite book Cassidy hesitated, after finally stating she could not pick just one. Cassidy has been doing volleyball for four years now. She played at her middle school St Joe's and continues to play for Padua and for her club team. When she is older she plans on coaching volleyball, and maybe even coming back to Padua to coach. She loves being part of a team and is a great team member. While explaining her views on teamwork and being on a team Cassidy used the phrase “Take one for the team” to describe her love for being on a team. Cassidy has never truly failed at anything, but she does have a strong dislike for the clarinet, which she played last year. She has no intentions on ever playing that instrument again, but she has always wanted to try out the piano. Cassidy is a big fan of One Direction and Taylor Swift. She also loves Jennifer Lawrence and is a huge Hunger Games fan, stating that it was one of her favorite books and movies. Although when asked who she would like to be instead of saying one of these celebrities she said her younger sister. Cassidy said, “I would just like to see me from her eyes.” about her twelve year old sister. Prior to attending Padua Academy Cassidy went to Saint Joe’s. There she met her great friends Sydney and Summer. They have been friends for almost 10 years now. Cassidy has a bright future ahead and Padua is the perfect place for it to begin.